Bayern Munich have the best digital media presence in China, according to a survey of the world's leading clubs. The fifth annual Red Card report placed the Bundesliga giants at the top of table, ahead of Manchester United. Prepared by Shanghai-based consultancy Mailman, the report looks at commercial success, engagement and social media. "Our report shows which clubs are making headway in this booming football market," Mailman chief executive Andrew Collins told BBC Sport. "China is different to the rest of Asia and clubs have found it hard to see financial returns here in the past. "But that is changing now and it all stems from the Chinese government's mandate to promote international sport, particularly football, and get the population more active. "That has unlocked huge sums of investment and the world's top clubs are desperate for some of that action." Is China taking over football? Chinese president Xi Jinping has made no secret of the fact that he would like to see China match its success in Olympic and Paralympic competition by becoming a football superpower, a goal that has so far frustrated Chinese fans. Chinese investors have bought stakes in European clubs like Atletico Madrid, Espanyol and Slavia Prague, as well as a 13% holding in City Football Group, which includes Manchester City, over the past 12 months. But money has also flowed into the domestic game, with high-profile names such as former England manager Sven-Goran Eriksson, ex-Italy manager Marcello Lippi and former Brazil boss Luiz Felipe Scolari being tempted to the Chinese Super League. They have been joined by players such as Ghana striker Asamoah Gyan, former Arsenal forward Gervinho and Brazil midfielder Ramires. With a bid to host the World Cup expected in 2026, football is on a steep upward curve in the world's most populated country, a development that can be tracked in everything from the value of broadcasting rights to the number of teams making pre-season visits. Why are Bayern so popular? Unlike the Premier League, Germany's Bundesliga sold its rights to a number of free-to-air broadcasters as opposed to a more lucrative pay-TV deal, which means its games are widely available. 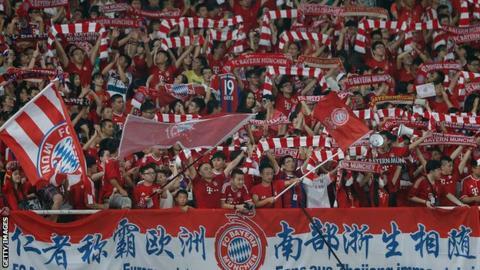 Bayern also played three games in China in July, when England's top clubs were focused on the North American market. But English football still commands big audiences on broadcast television in China and it has made the most progress in the burgeoning market for live games that are broadcast over internet connections. "Youngsters in China watch everything online on their various devices," explained Red Card co-author David Hornby. The growth of IPTV is one of the nine different "performance metrics" that Red Card analyses across Weibo (China's answer to Twitter), the messaging service WeChat and each club's official website, online shops and video offerings. In terms of social media followers, Manchester United and Manchester City lead the way by some margin. However, City score relatively poorly in terms of comments, forwards, likes, mentions and reads, which is how Mailman measures engagement. In contrast, Bayern score highly here, followed closely by Barcelona, Liverpool and AC Milan. "Engagement is the most accurate measurement of popularity in China," added Hornby. "The size of your Weibo following is often in no way representative of how engaged your fans are - and that is what clubs are really interested in." Hornby added that some clubs saw their Weibo followings fall this year after a crackdown on the number of fake accounts. Among the report's other findings were that Spurs have the most viewed channel on China's version of YouTube, Youku, while Manchester United and Liverpool have the two WeChat accounts that are most widely read and interacted with. But the report also highlighted the fact that the three best players in the world - Lionel Messi, Neymar and Cristiano Ronaldo - do not have Weibo accounts yet. In a country where fans are traditionally drawn more to individuals than teams, that represents a missed opportunity for them and their clubs.